Perhaps no room is more frequently utilized in any home than the bathroom, which makes it a popular choice for remodeling. At ProSource® of Philadelphia, we assist trade professionals in finding the perfect products for any bathroom remodel. Whether your project is small or large, we have the perfect components to make your client’s dream bathroom become a reality. We invite you to come plan your bathroom design with our expert team today. Choose from all the brands you trust at prices you can afford. With unique options such as slab sinks and stunning pedestal sinks, the bathroom sink can truly be an eye-catching piece of a bathroom remodel. 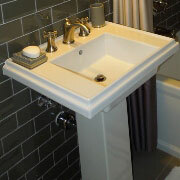 Talk to us about how you can utilize a beautiful sink in your next remodel. When you swap out old, outdated faucets for new ones, you might be surprised at how big of a difference these small components make. 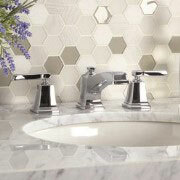 Check out bathroom sink faucets in every shape, size, and style imaginable. Create a stunning oasis your client will love when you choose from our selection of new showers. From modern styles to traditional, we can help guide you to the perfect shower for your needs. Short on storage space? Looking for a piece that will help the room stand out? 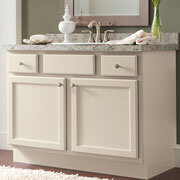 Browse our beautiful vanities and create a stunning new look that will expand usable space. Is your client looking for a bit more luxury in their life? The right tub can set the tone for a spa-like setting. 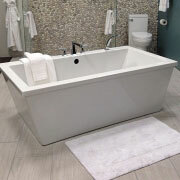 From jacuzzi tubs to deep clawfoot tubs, we have the perfect fit for you. When it comes to designing a new bathroom, you need everything to be functional and visually appealing. 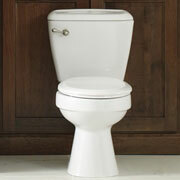 Check out our name-brand toilets at wholesale prices to put the finishing touches on your bathroom remodel.